AWESOME PRICING !! 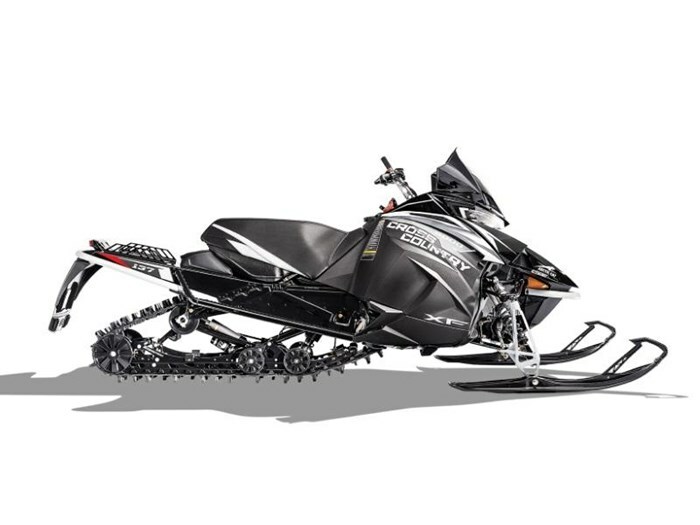 2019 ARCTIC CAT XF 8000 CROSS COUNTRY LIMITED ES 137 - ONLY $13,899 PLUS FREIGHT, PDI, TAX AND LICENSING - BI-WEEKLY PAYMENT OF $117.00 FOR 84 MONTHS - FOR MORE INFORMATION PLEASE CALL CHARLIE OR LORNE AT 519-268-8429 - FOR MORE GREAT DEALS ON PARTS,ACCESSORIES AND UNITS PLEASE VISIT US AT OUR WEBSITE - www.fasttrackperformance.ca 2019 Arctic Cat® XF 8000 Cross Country Limited ES 137 Features may include: 8000 C-TEC2 ENGINE WITH DSI The 8000 — efficient, responsive and fresh out of St. Cloud, Minnesota. This 2-stroke engine features noticeably faster throttle response and acceleration compared with our previous 8000, plus up to 30% reduction in oil consumption below 7000 rpm, 36% increase in low-end torque and 18% increase in midrange torque. Delivering a rare combination of increased power, reduced emissions and ultra-low oil consumption, the overall crispness sets new standards for performance and rideability in the 160-HP class. NEXT-GEN BODY PANELS Arctic Cat’s Next-Gen body panels are designed to seamlessly cut through the air with as little atmospheric tension as possible. With only a quarter-turn of the two quick-release tabs, the side panel comes off and provides easy access to the engine compartment for general maintenance. ARCTIC DRIVE SYSTEM The Arctic Drive System features CVT drive and driven clutches for a combination of smooth shifting, optimal performance, maximum durability; great serviceability; and reduced weight. The new drive clutch features a roller bearing on the shaft that enables an auto-adjusting belt tension design and delivers consistent performance without manual adjustments. It also features a 12.5 percent lower effective starting ratio (while maintaining the top ratio) for smoother engagement and reduced belt wear at drive-away speed, with more evenly distributed force for lower belt pressure. 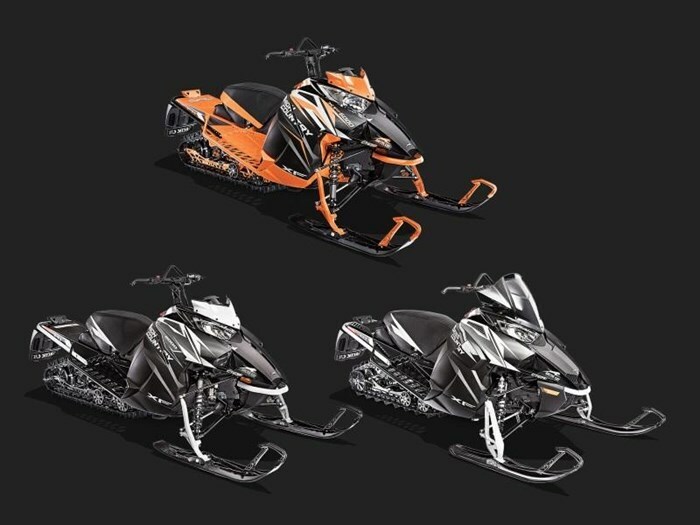 It’s a design that’s unique to Arctic Cat. DELUXE DIGITAL GAUGE This dual configurable LCD screen gauge allows to you check all the vital information about your snowmobile and more. 14 different readings to be exact. There’s an odometer, speedometer, max RPM, 2 trip meters, engine hours, low oil light, coolant temperature, exhaust temperature, intake air temperature, battery voltage, fuel level, clock, reverse indicator, hand warmer and thumb warmer. LED W/ ACCENT LIGHT Features LED headlights for enhanced lighting performance. Want the high beams on? The low beam will also stay on to give you a nice, wide light pattern with excellent distance. Plus, special LED accent lighting comes on when you turn the key. PROCROSS - 6 SKIS This trail ski’s 6? MID-HEIGHT WINDSHIELD The perfect mix of protection and comfort, keeping any spray from slowing you down when the going gets really fast.